Atlanta, GA, November 9, 2018: At the core of the nine-day festival, Navaratri, lies the celebration of a specific aspect of God – the feminine. Nine forms of Goddess Durga, each form representative of a specific trait is worshiped by the Indian diaspora across the world. 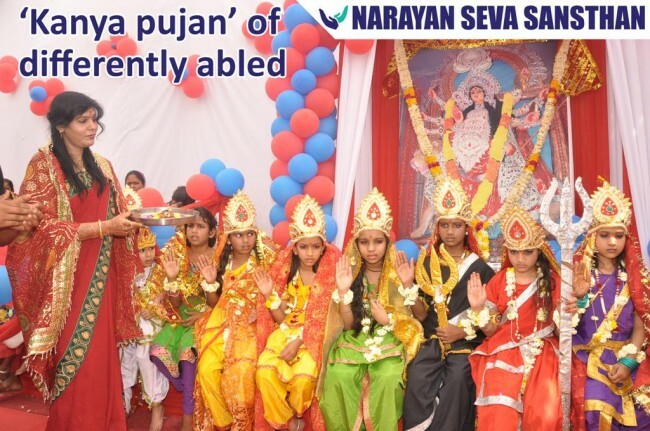 Embracing the women’s empowerment aspect of the festival in the most meaningful way, charitable organization Narayan Seva Sansthan (NSS) in Udaipur provides corrective surgeries, free of cost, to divyang (differently abled) girls and then worships them as goddesses in the Kanya Pujan ritual. In 2016, 701 girls, in 2017, 501 girls and in 2018 a total of 601 girls were provided free corrective surgeries during Navaratri. “Underprivileged and differently abled are part of our society, and no different than my loved ones. They deserve the same respect and dedication from me that I show to my God. It’s my honor and privilege to associate with NSS and I am very proud to represent the community of underprivileged and differently abled around the globe,” says Manoj Barot, the Atlanta based Executive Director of NSS in the US. The NSS grounds house 1000-2500 people, welcoming differently abled girls and their families to avail surgical treatment, medicines, physiotherapy, aids/appliances, artificial limbs, post-surgical rehabilitation and free lodging and boarding on the hospital campus, all free of cost, including free transportation from the railway station. Vijayadashami/Dusshera, celebrated at the end of Navaratri is observed for different reasons and celebrated differently in various parts of India. In the south, it marks the victory of Goddess Durga over the demon Mahishasura. In the north, it is a celebration of Lord Rama’s victory over Ravana. At the NSS, the nine-day treatment camp culminates to a grand finale turning the atmosphere truly festive. The differently abled girls treated for corrective surgeries are now dressed in traditional Navaratri and goddess costumes. Covered with bandages and plasters, they are worshipped with the same rituals as goddesses are, during Navaratri. The girls are presented gifts to take home. Vandana Agarwal, Director of Navaratri, NSS Style event personally takes care of these girls and ritually worships them at the traditional Kanya Pujan. 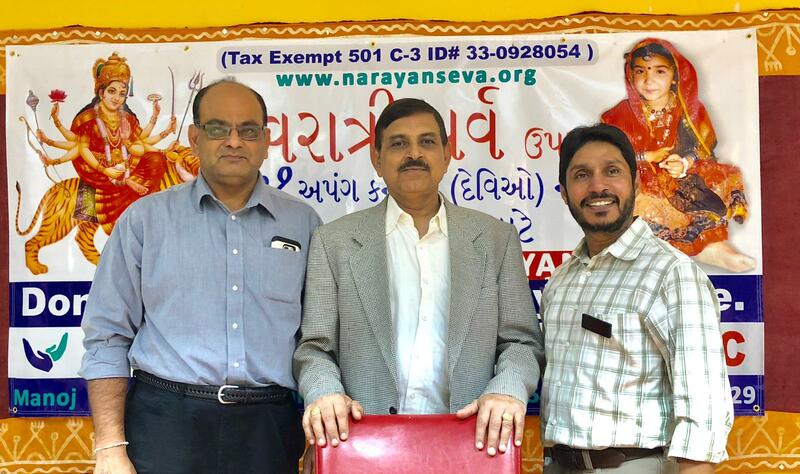 “Since more than 15 years we have been celebrating Navratri and Kanya Pujan NSS Style which is very unique. Each year I feel further encouraged to continue and expand unique Navaratri NSS Style for many years to come,” says Agarwal. “Corrective surgeries have resulted in freedom from disabilities,” says a passionate and dedicated Prashant Agarwal, President of NSS. “NSS is lucky to have Manoj on their side representing NSS in USA and representing the whole underprivileged community of differently abled. We are now convinced that our association with him will connect us with mainstream USA and many other countries,” he adds. Founded by Padma Shri Kailash ‘Manav’ Agarwal in 1985, NSS is located at Badi Village near Lake City Udaipur, nestled in the picturesque Aravali Hill ranges. A smart campus for differently abled, NSS is equipped with all facilities for the physically impaired. The Sansthan has 1100 bed hospital, a team of 125 doctors and other medical staff, performs 85-100 corrective surgeries, diagnosing 300-400 patients in the out-patient clinic almost daily. The organization has a complete physiotherapy center, prosthetic and orthotic lab and provides free meals to 3000 to 5000 patients and attendants daily. NSS has garnered recognition as the surgical center providing free of cost corrective surgeries and help to physically impaired patients suffering from Polio, Cerebral Palsy etc. from India, Afghanistan, Pakistan, Nepal, Bangladesh, Uganda, Ukraine, UK and USA. With a core mission to turn disability into ability and empower girls and women, NSS has performed 370,000 (and counting) corrective surgeries for the past 30 years. It has also developed and provided several skills and vocational training for the differently abled offering socio-economic support along with best of the medical services, medicines, aids and appliances.